WASHINGTON (AP) - Thousands more migrant children may have been split from their families than the Trump administration previously reported, in part because officials were stepping up family separations long before the border policy that prompted international outrage last spring, a government watchdog said Thursday. Most of the tens of thousands of children who come into government custody cross the border alone. 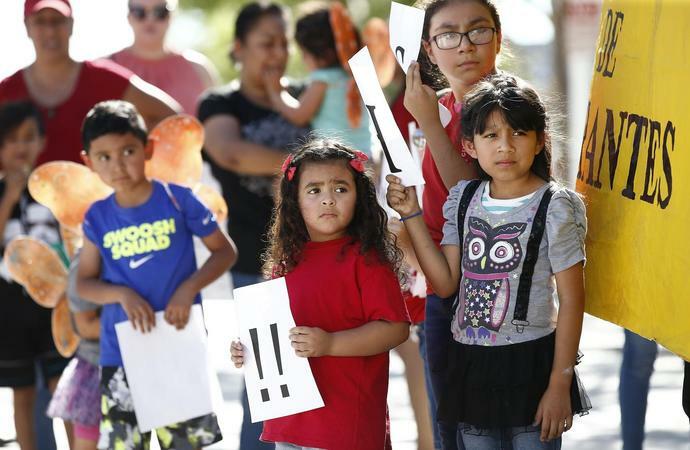 But the report found that in late 2016, 0.3 percent of children turned over to Health and Human Services had crossed with a parent and were separated. By the summer of 2017, that percentage had grown to 3.6 percent, officials said. The watchdog did not give exact numbers, but the total number of migrant children who passed through the agency's care during the 2017 budget year was 40,810. The separated children had already been released to sponsors, who are generally parents or other close relatives. The inspector general did not say why the children had been separated before the zero-tolerance policy. Immigration officials are allowed to take a child from a parent in certain cases - serious criminal charges against a parent, concerns over the health and welfare of a child or medical concerns. That policy has long been in place. Last spring, then-Attorney General Jeff Sessions said anyone caught crossing the border illegally would be criminally prosecuted. Families were brought into custody by U.S. Border patrol officials, then their parents taken to criminal court. If the parents were gone longer than 72 hours - the length of time Border Patrol is allowed to hold children - the children were transferred to the custody of Health and Human Services. Despite "considerable" effort by Health and Human Services to locate all the children placed in its care, the report said officials were still finding new cases as long as five months after the judge's order requiring reunifications. They said it's not clear the system put in place to track separated children is good enough. And the lack of detail from immigration authorities continues to be an issue. The border remains a crucible for the Trump administration, with a partial government shutdown that has dragged on nearly a month over the president's demand for $5.7 billion for a border wall that congressional Democrats are unwilling to provide. The inspector general's office was also looking into other aspects of the separations, including the health and mental well-being of the children who had been separated. It expects to have other reports on the topic. Democratic Rep. Bennie Thompson of Mississippi, chairman of the House Homeland Security Committee, said he would hold the government accountable in the matter. "The Trump administration, with its unique blend of incompetence, cruelty, and disregard for basic decency, misled the American public on one of its most heinous policies to date," he said in a statement.